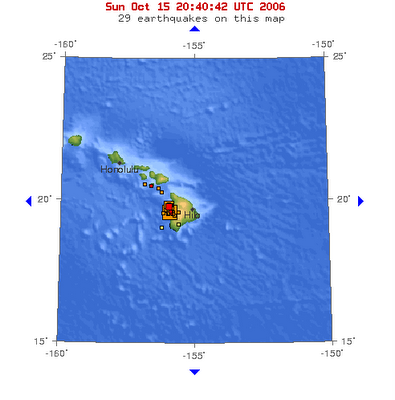 I blogged about the 10/15/2006 earthquake in Hawaii last week here and here. 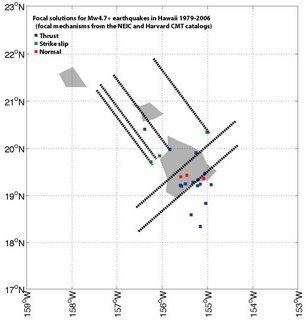 The image below shows the focal solutions for all of the earthquakes in the NEIC catalog. The focal solution for the Oct. 15 2006 event is shown in red. The south end of the island seems pretty straight forward. All of the faults strike NE-SW. Thrust faults occur at depth (there's a rough transition at ~10 km, but the shallowest thrust event was 4 km), and normal faults occur above that. I'm picturing something like synorogenic collapse; Hawaii is a very thick pile of material and it's about as tall as it can be, so it makes sense to me that the upper part of that pile is extending. Extension would thin the pile making it more stable (something like the detachment in the upper part of the Himalayas). The northern part of the island where the Oct. 15 event occurred is more complex. 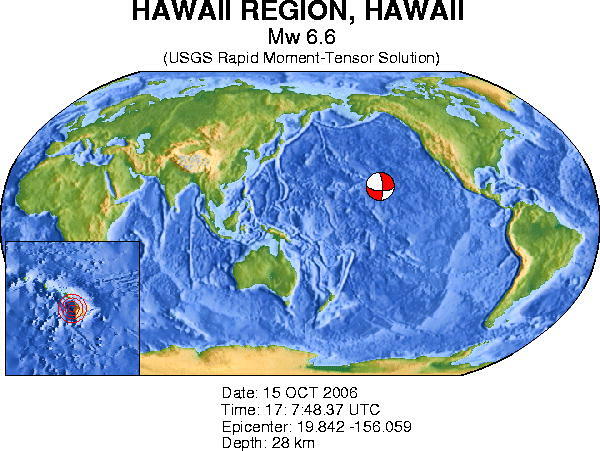 There are two significant thrust events in that area, but they occurred on faults that strike NW-SE (EDIT: I forgot to mention that one of these thrust events was a Mw 5.8 aftershock of the Oct. 15 quake) , or in other words, at a very high angle to the thrusts at the southern part of the island. 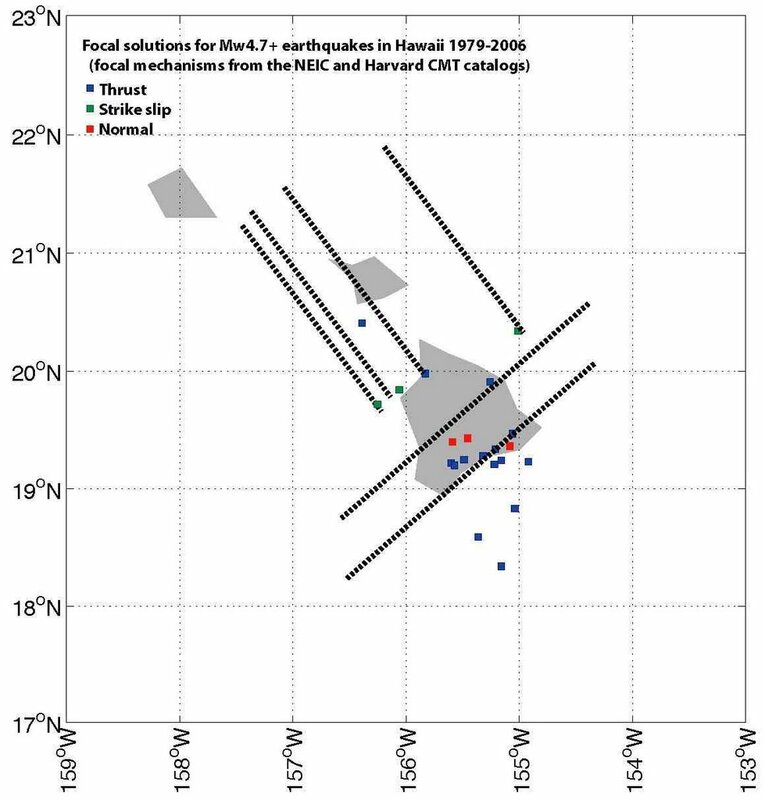 So, it seems pretty clear that the stress field that's causing the thrust faults on the northern part of the island is different from the stress field that's causing the thrusts on the southern part of the island. 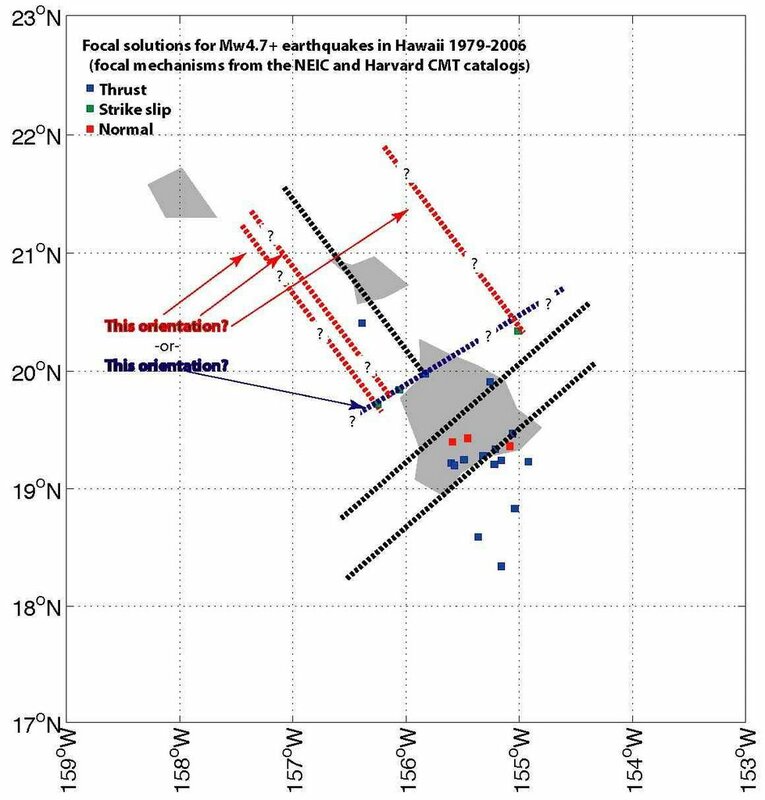 I also favor a NW-SE orientation for both the strike slip and the thrust faults at the northern part of the island because something similar is observed in other parts of the world. For example, there are active thrust faults that are parallel to the San Andreas fault (a strike slip fault). 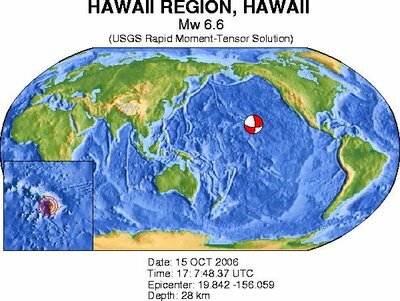 In that case the two styles of faulting are caused by the oblique convergence of the Pacific and North American plates, so the SAF system isn't directly analogous to Hawaii. However it is an example of two different styles of faulting resulting from the same regional stress field. 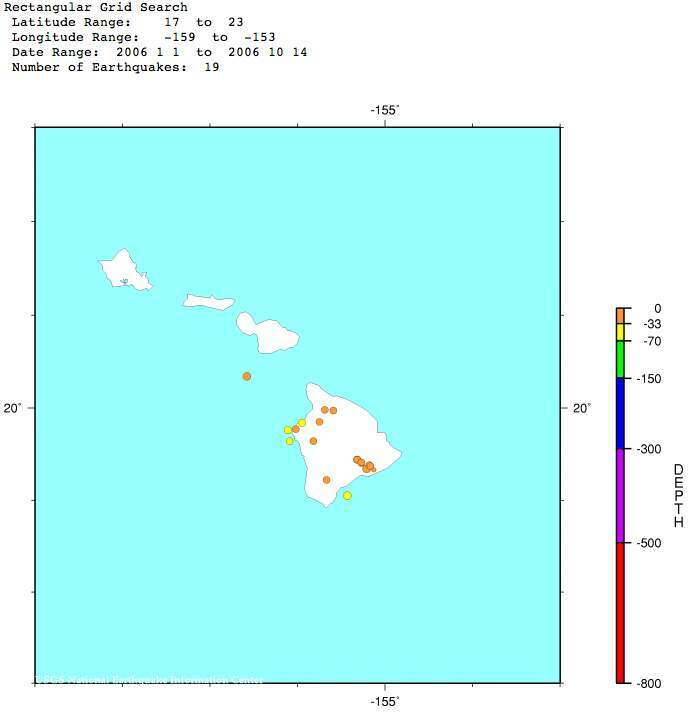 The black symbols are for the southern portion of the island, and they cluster pretty tightly. There's certainly a lot more scatter in the northern portion of the island. So, the stress field in the northern part of the island is a lot more heterogeneous than in the southern part of the island. 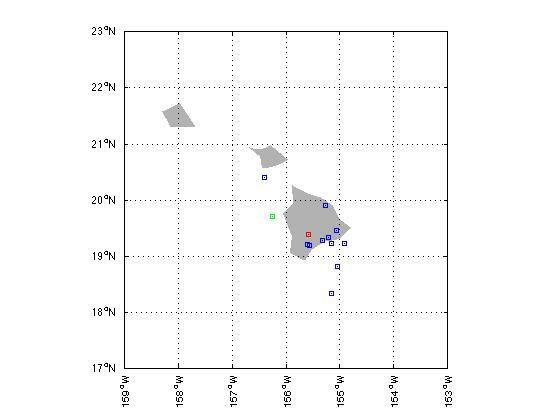 There does appear to be some overlap between the northern and the southern part of the island. 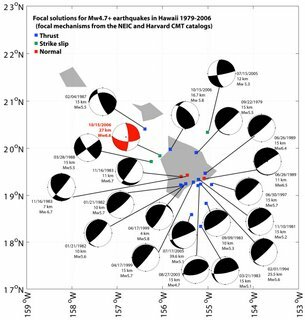 The trend of the maximum principal stress for the Oct. 15 2006 quake is pretty similar to the trend of the maximum principal stress for the thrust events in the southern part of the island (shown below). 1) The thrust faults on the southern part of the island are resulted to the growth of the island, while the shallower normal faults are caused by extension resulting from something analagous to synorogenic collapse. 2) The stress field at the northern part of the island is much more heterogeneous than at the southern end of the island. As I discussed in an earlier message, I'd bet that the magnitude of the minimum and intermediate principal stresses at the northern end of the island are pretty similar. 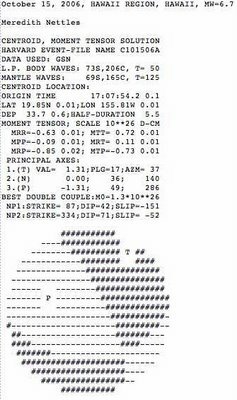 This means that both thrust and strike slip events would occur. 3) Both the thrust and the strike slip faults at the northern part of the island are oriented NW-SE at a high angle to the faults at the southern part of the island. 4) The northern part of the island is subjected to both local stresses related to the Hawaiian islands as well as more far field stresses associated with the movement of the Pacific plate. These far field stresses are swamped by the local stresses at the southern part of the island. The NE-SW faults are associated with local stresses while the NW-SE faults are driven by both local and far field stresses. At least that's my best guess. From Cognitive Daily comes the Directory of Open Access Journals. They have 42 journals in their geology section. Worth a look. The part of Texas I live in has been getting hit with a lot of rain. Up to 10 inches in 24 hours. Fortunately our house in on high ground, but one of the two roads to it is not. There was a respectable lake across the road I normally take. Rain storms like this are going to take some getting used to. 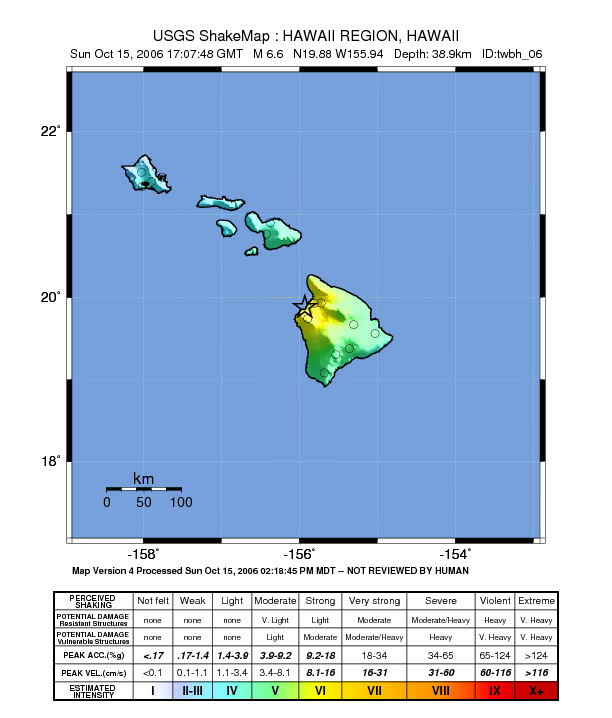 A M 6.6 earthquake occurred in Hawaii today at 7:07 AM local time. 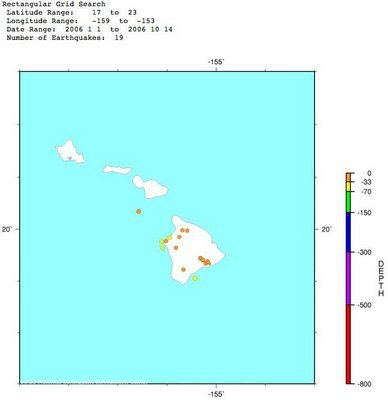 The summary page from the NEIC is here and a page listing the main earthquake and many aftershocks (including an M 5.8 event) is here. The most intense shaking was 6 on the Modified Mercalli Intensity scale which means light potential damage for earthquake resistant structures (things like wood frame houses, modern buildings designed with earthquakes in mind and seismically retrofitted older structures) and moderate potential damage for vulnerable structures (unreinforced masonry, buildings with soft first stories, older buildings) . Here's CNN's coverage. According to them communications have been disrupted, but there are no reports of injuries or building damage. There were concerns about the structural integrity of a hospital there, and new patients were being kept outside. The most significant event CNN reports is an earthquake-related landslide near a major highway. 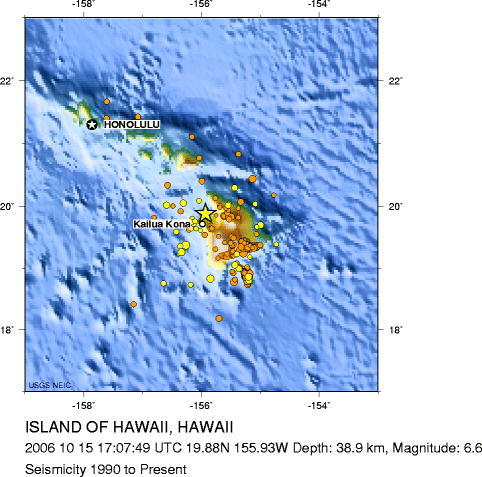 For comparison the largest historic event in Hawaii was an M 7.9 event in 1868 that resulted in 77 deaths from an earthquake-induced landslide and a tsunami. "An analysis of air samples taken in the region on Wednesday found radioactive material that is “consistent with a North Korean nuclear test,” according to a document sent to lawmakers on Capitol Hill on Friday by the office of John D. Negroponte, the director of national intelligence. But a senior intelligence official, who spoke on condition of anonymity, said that the results were still preliminary and that final analysis of the data would not be completed for several days." I'm definitley arriving late to the party, but I wanted to comment on the story of a group of students at Columbia University who stormed the stage during a speech by Minutemen founder Jim Gilchrist. here (with a wonderful personal anecdote about Bollinger). I left a comment at No Se Nada, and I wanted to expand on it here. I spent a fair number of years at the University of Michigan and Lee Bollinger was president for a good chunk of that time. I remember a few incidents during Bollinger's tenure. “For the past ten days, we have been engaged in discussions with students including the students occupying the tower of the Union. We do not believe that occupation is the way to resolve issues within the University. In this instance we felt that it was in the best interests of our educational process for the University to pursue that discussion to a reasonable resolution. “Any conversation must have starting points. For a University, a fundamental principle is that, with rare exceptions, students, faculty and staff must not be treated differently because of their beliefs or the expressions of those beliefs. That principle has direct application to this controversy. Some have argued that one of the societies using the Union tower space, Michigamua, should be stripped of its University affiliation and lose its exclusive use of that space because it has a history of practices that demean and degrade Native American culture and spirituality. Under our principles it is clear that student organizations must not be recognized or de-recognized, or suffer any other penalty, because the ideas they espouse or beliefs they adhere to are offensive, or even dangerous, to our community. I have spoken to leaders of the groups occupying the tower, other students and faculty, and they, too, value this principle. “Neither viewpoints nor legacy necessarily entitle any group within the campus to privileged space. We will address, in a neutral way, the process of space allocation among student organizations within the University. “It must be said, again and again, that responsible membership in our University community implies caring about the perceived impact of one’s actions on others. Of particular importance are perceptions, however unintended, of cultural offense, and those behaviors that cause others in the community to be excluded and unappreciated. Whether conscious or not, practices that negatively stereotype groups in our society cause unjust pain and humiliation. I believe such practices are not acceptable behaviors in a University that values and fosters diversity. We must never take lightly the effects of such perceptions and behaviors. “Current students of Michigamua acknowledge that its history has included practices demeaning of Native American culture. None of us, however, can count ourselves free of embarrassment and even shame for what we have once believed or practiced, not even the University of Michigan. He agreed that demeaning Native American culture is inappropriate, admonished SCC for occupying the office, and didn't take the easy out of condemning the present members of Michigamua for the behavior of past members. "As I stressed in my Statement of February 17, 2000, "practices that negatively stereotype groups in our society cause unjust pain and humiliation. I believe such practices are not acceptable behaviors in a University that values and fosters diversity. We must never take lightly the effects of such perceptions and behaviors." While this University honors the principle that individuals and groups within the University community must be free to express a wide variety of beliefs and ideas, it is also committed to ensuring that its own institutional voice on the subject of racial and ethnic respect be unequivocal. The University simply does not condone practices that denigrate the values or traditions of particular racial or ethnic groups. Finally, it must also be said that the University does not condone the illegal occupation of University premises by any student group. The recent protests about the Michigamua student organization have raised an important question as to the proper nature and scope of University involvement with student organizations. Accordingly, the panel described in my Statement of February 25, 2000 that is considering the question of privileged space also will consider under what circumstances and in what ways the University, its administrators and faculty members should be associated with such organizations and it will recommend guiding principles in this regard. The University's Executive Officers and I will then decide whether and how to implement such principles. In considering this issue, the panel will consider the concerns that have been expressed about whether and to what extent associations between the University, its administrators or faculty can or have given rise to the impression that the University endorses racial or ethnic ridicule, and whether and to what extent those associations can or have contributed to marginalizing or disenfranchising other groups or students. The panel will also consider applicable civil rights and anti-discrimination principles as well as applicable First Amendment principles such as freedom of speech and freedom of association. As with the question of privileged space, the panel will gather public input in a variety of ways including holding public hearings to solicit student, staff, faculty and community member input. The panel will work expeditiously and make its recommendations regarding space before April 13, 2000. The panel will make its recommendation on all other issues before it by October 2, 2000. The decisions the University makes about the assignment and use of the Michigan Union tower and any other exclusively assigned space will be made prior to the beginning of the Fall 2000 academic term. The panel will issue its findings and recommendations on all questions before it in written form, and those findings and recommendations will be published to all interested parties and the public." In the end Michigamua got to keep their name, but agreed to move out of the Union. Their website is here. I remember a few other incidents. When the U of M affirmitive action case was just starting there was a flurry of activity on campus. Two of the speakers stick in my mind. Jesse Jackson came to give a talk in favor of affirmitive action (I save one of his placards - I rediscovered it while I was moving out of my office at the end of grad school). Fred Phelps and his group came to protest. I vividly remember an ~five year old boy holding a sign proclaiming "Matthew Shepard is burning in Hell." Despite the disgusting nature of Phelps' group they were allowed to protest unmolested. I also remember a preacher who'd hold up a sign on the Diag and comdemn passing students to an eternity of fire (I know that this was at least a weekly event but I don't remember if he did this more often). He was occasionally heckled, but he was never stopped from speaking. During the 2000 elections the campus Republicans had a table set up on the Diag, and they were even able to hand out collections of G. W. Bush's speeches (I got a copy and had a lot of fun sneaking it on to my friend's bookshelves and seeing how long it took them to notice). I also remember an instance when a group of abortion protestors rented a truck and drove it around campus with pictures of aborted fetuses. "Of course, the University is thoroughly investigating the incident, and it is critically important not to prejudge the outcome of that inquiry with respect to individuals. But, as we made clear in our University statements on both Wednesday night and Thursday, we must speak out to deplore a disruption that threatens the central principle to which we are institutionally dedicated, namely to respect the rights of others to express their views. This is not complicated: Students and faculty have rights to invite speakers to the campus. Others have rights to hear them. Those who wish to protest have rights to do so. No one, however, shall have the right or the power to use the cover of protest to silence speakers. This is a sacrosanct and inviolable principle. It is unacceptable to seek to deprive another person of his or her right of expression through actions such as taking a stage and interrupting the speech. We rightly have a visceral rejection of this behavior, because we all sense how easy it is to slide from our collective commitment to the hard work of intellectual confrontation to the easy path of physical brutishness. When the latter happens, we know instinctively we are all threatened." The students who stormed the stage were thugs, plain and simple, and they deserve to be prosecuted. Ending on a lighter note The Daily Show covered the event here (hat tip to The Volokh Conspiracy). The best line of the clip is (paraphrasing): "Congratulations protestors, you've managed to make Sean Hannity seem like the reasonable one." I'm currently a visiting assistant professor. I found out today that I'll be promoted to a tenure track position at the beginning of the next academic year. I also found out that I'll be able to purchase a piece of equipment that I've been wanting for some time (a hand held XRF machine). I've got three projects that have been on hold that I can finish now. A 700-1800 kiloton blast from 1992. The largest underground blast since 1976 according to that site. The station was 11420 km from the blast. 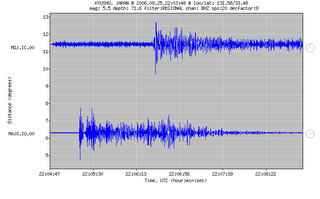 For comparison the 1995 M6.9 Kobe earthquake (10600 km from the station and 22 km deep). 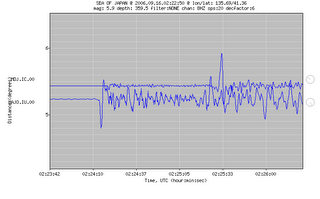 (note that this seismogram is ~1 hr long while the seismogram from the nuclear blast is only ~20 minutes long). As I learned in the comments from thread at No Se Nada a sesimogram from a blast is dominated by P-waves. I can certainly see the lack of S waves in the recording from the nuclear blast (assuming they were cut from the plot). "Livermore seismologist Bill Walter explains that the differences in seismic P- and S-wave energy provide one method of discriminating explosions from earthquakes. Seismic P waves are compressional waves, similar to sound waves in the air. Shear (S) waves are transverse waves, like those that propagate along a rope when one end is shaken. Because underground explosions are spherically symmetric disturbances, they radiate seismic P waves efficiently. 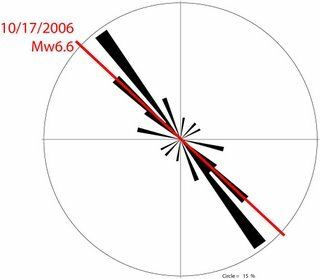 In contrast, earthquakes result from sliding or rupture along a buried fault surface and strongly excite the transverse motions of S waves. 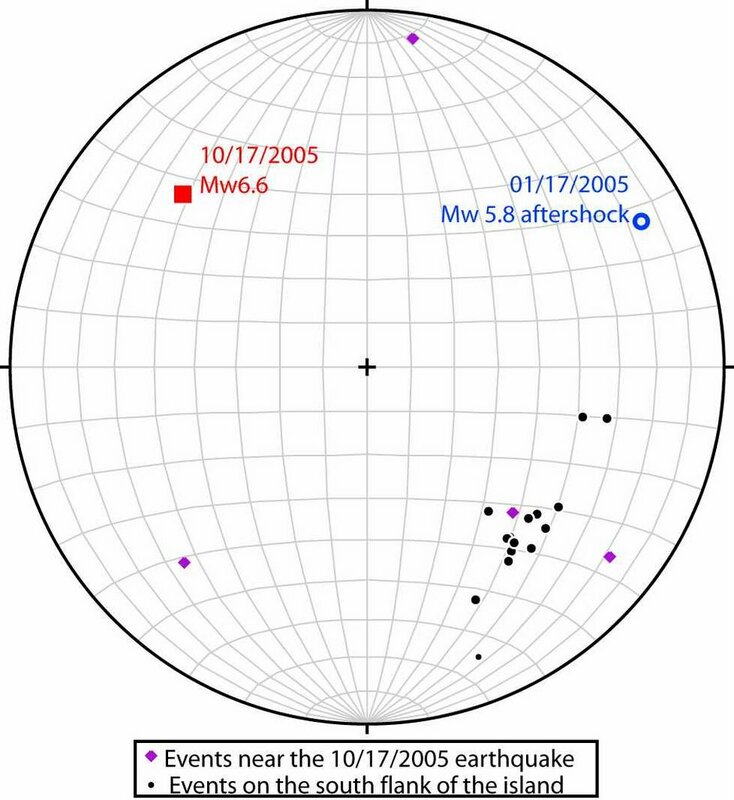 Thus, we expect that explosions will show strong P waves and weak S waves and that earthquakes will show weak P waves and strong S waves, as seen in Figure 2." 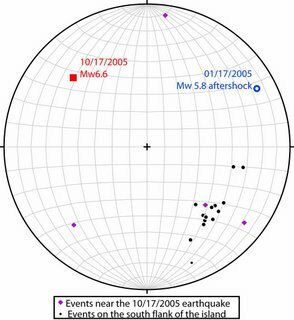 The LLNL page also has a good discussion of the difficulties in inferring blast yields from seismograms. UPDATE: I forgot to give a link to the LLNL page. UPDATE: Lab Lemming has a couplenice posts on this topic. The North Koreans conducted an underground detonation of a nuclear bomb today. 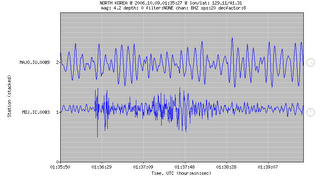 These are the seismograms of the nuclear test in North Korea (data from the IRIS website. This image shows the same data with a regional filter applied (1-10 Hz). I don't know the rationale for applying this filter, but it looks like that's the way IRIS displays their data (can you tell I'm not a seismologist?). For comparison here are the records from the same stations for a M5.9 event at a depth of 359.5 km in the Sea of Japan (both stations were further from this earthquake than they were from the North Korean test). This is a plot without a filter. This is a plot with a filter. 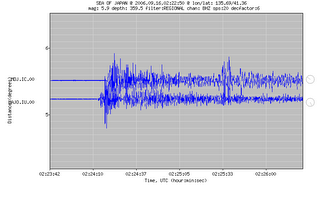 Here's another earthquake for comparison. 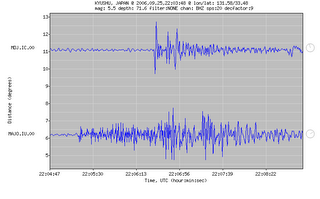 This one is a M 5.5 event at a depth of 71.6 km that occured near Kyushu. I'm not sure how to distinguish between a nuclear blast and an earthquake. To my untrained eye it looks like the North Korean event is more impulsive (for lack of a better word) than the Sea of Japan event. However the North Korea event looks similar to the Kyushu event to me (of course the Kyushu event is much closer in depth to the North Korea event too). I see some differences in the later arrivals, but I don't know if I'm just seeing things. 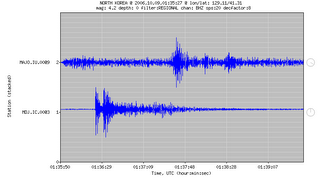 I forgot to link to the post at No Se Nada that prompted me to look for the seismograms for the North Korean test. Highly Allochthonous (great name) also has a post.